Hello sweet friends! 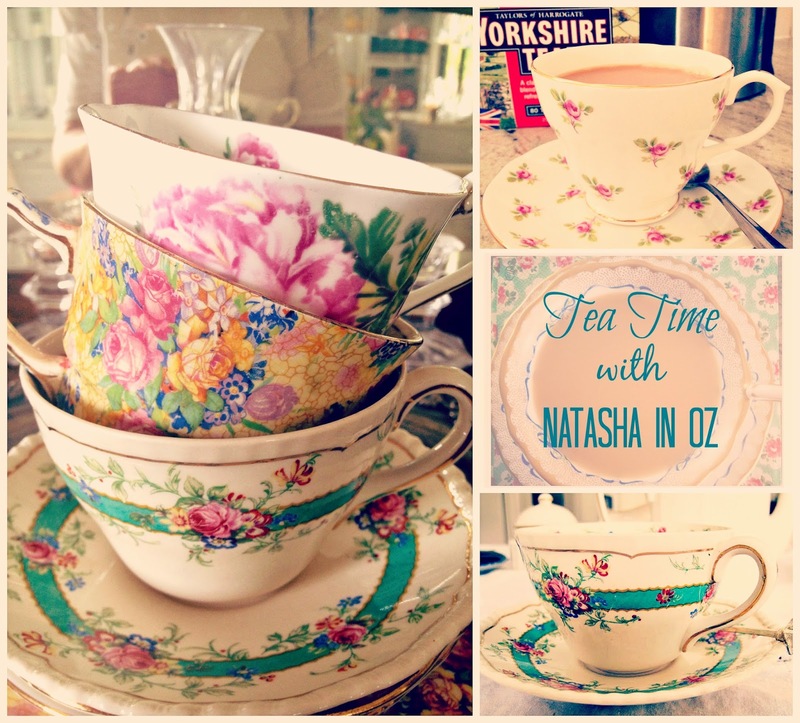 Thanks so much for stopping by to Say G'Day and for joining me for this week's Tea Time post. I can't believe that we are into the second week of the Autumn school Holidays! Even though the two boys in the house have been nursing broken bones we have really been having such a great time. We have been doing lots of things at home and enjoying lots of time together as a family. Yesterday we had a delicious lunch at a great Japanese restaurant called Mizu in Teneriffe. Even though the boys had broken arms they still managed to enjoy their bento boxes! I had a pork Tonkatsu bento box which came with Tempura prawns, sashimi, salad and miso soup. Mr Attorney and Alastair had a bento box with fried chicken and pork dumplings and Madeleine had one with Teriyaki chicken. We all enjoyed some hot green tea with our meals too. Mr Attorney managed beautifully with the chopsticks! After lunch we went antiquing and I found 6 of these lovely linen napkins. The fun times continued at home where the kids played on the wii to try and get their "fitness age" down. I hope that they can spare 5 minutes to have morning tea with me! Madeleine enjoys a nice hot cup of tea but Alastair will just have some milk. Today we will be enjoying some yummy biscuits that my sister Stacey made for us for Easter. Today we will be having my favourite assam tea called Dimakusi British Orange Pekoe. We buy all our loose leaf tea from The Tea Centre in the Brisbane Mall and their website is full of interesting information about different types of tea and they have really interesting fact sheets to download. The Tea Centre website describes this tea as ‘dark, malty and strong’ and it is from the Dimakusi district. It is not bitter at all and I think it is best with milk and sugar. The tea centre suggests a brew time of about 5 minutes. 5 minutes is just right for me! When it comes to preparing tea there are many theories but I think that this video from Jonathan Hudson Evans, who sources tea for Jamie Oliver, is perfect...to a T! How to make the perfect cup of tea from Jamie Oliver on Vimeo. Assam dimakusi is a malty black tea and is a good alternative for people who like English breakfast tea and want to try something different. I love it and I hope that all of my tea time guests will too! Well, I'd better go now as I am also cooking an Indian meal for my parents tonight. We are having Butter Chicken, Spinach with paneer cheese, pappadums and chai tea! I hope it all works out! See you next time and thanks so much for coming to spend some time with me today. I just love it when my beautiful friends stop by to see me to say G'day! Hi Natasha, 8.00am here in the UK and we have a lovely sunny morning. Your blog always makes people feel so welcomed and I feel as though I was with you for the meal and the tea. Pleased to hear the boys are getting on well and still able to enjoy eating and playing on their wii. I am sure the meal with your parents went well. I love Japanese food - it all looks so tasty. I love your tea cosy. And Indian food for your parents - yum! So glad I found your blog!! I had Japanese food for the first time in Hong Kong and loved it. Those linen napkins were very interesting to see Natasha as I have almost identical table linen that my MIL has passed on to me! Your photos are so inviting, I would love to join you for tea. It look so nice all kind of food. I love the Japanese food very much. Big hug and have a nice day! Natasha, This is beautifully done! The Japanese meal looks so good - very nice photography! Your tea vignette is informative and again the food and photography is superlative. I would love to take tea with you and have some of those delicious biscuits! Hi Natasha..wow...what a fabulous post! I am dazzled by such an array of beautiful foods and tea..lovely! I didn't know the boys arms were broken. I need to go back and catch up with your posts. Bless their hearts. The food looks so good and I know it was. I love your white tea pot..my favorite. And I LOVE LOVE your canister set. It's beautiful. It's a free program...photoscape.com, and you can do a thousand things with your photos using it. The different ways to do mosaics alone is priceless...I think you will just love it, too. There's all kinds of ways to make the photos look different....let me know if you like it. What a lovely post! And a coincidence, too! Last night I was talking about the same subject, it seems like having tea is a spiritual connection with friends and family. You really know how to make a person feel welcome for tea! The Japanese food looks good and your linen napkins are beautiful! I had to go back and read about the broken bones! So sorry to hear about that and how bizarre that it would happen within hours of each other! Hope they're both recovering nicely. Enjoy your Indian food tonight. Now I want some bento boxes :) Your sister's cookies are perfect with the tea you bought. Did you use thoese beautiful napkins? the food was not only beautiful but made me hungry. do you happen to have a recipe for those biscuits and would you share? Thanks and have a great day! Glad to hear the boys are getting better. Sounds like broken bones are not keeping them down. The bento boxes look great! My sons would love those. What a lovely tea! I would not mind a cup of tea right now! Lovely post and I hope you had a wonderful visit with your friends. Hope the boys are mending. What a lot of yummie yummie here on your blog...........i have hungry now...........just home from the shop and i must cook now.........lovely cookies and that tea........mmmmmmmmmmmmmmmmmm....it was a pleasure to come and visit you today !! I just love this post. I am a tea lover and to me there is nothng to beat tea time. I even have my 12 years old grand daughter and her mom to join me when they come to visit. Great photos of your adventure. Natasha, it is always a treat to drop by and see what you are doing. The Japanese know how to present a meal with such grace and simplicity. Like Lindy Lou Mac, I also have a small table cover, made by my mother, that is very similar to your napkins. That must have been a popular motif. I am so glad that you posted Handel's masterpiece too. Words do not do it justice. It was also considerate to mention my blog. Thank you. It's always nice to have tea with someone from a different country. The loose tea you showed looks like currants but I guess the leaves were clumped together. Would love to join you for tea!! Natasha you have such an interesting life!!! I love nosing around in it :) LOVE the Bento Box lunches! Yours was definately the most adventurous! I used to be more adventerous with my sashimi but as I get older I am eating alot more boring :) But I do love some good sushi! Your tea looks fabulous! Watch out I might show up at your door too! A tea AND an Indian Dinner...okay you win! Your amazing! Hope you had fun with all your guests today!!! Your pictures are breathtaking! You make us feel like we are having tea with you! I also loved your "sister's blog" - I have 2 sisters as well and they are my very best friends! I'm in love with your glass canisters! Your blog is adorable and makes me hungry. I would love for you to check mine out if you get a chance! Thanks god bless! The meal looks amazing! Thanks for sharing the wonderful pics! Oh your tea looks wonderful. I love having tea, going to tea, tea before bed....and those biscuits...yum! Everything looks so tasty..and elegant..very beautiful! Natasha darling I was getting ready to go to bed and now I can't. I am so hungry after looking at all these delicious images. Hope Mr. Attorney's arm gets better soon, I will include Mr. A in my tonight's prayer. Wondering who I am? Read my post: Who Are These People?! Oh, so sorry about the guys broken bones! Seems like they enjoyed their wonderful meal, with Tea out as much as I did. Loved the video! Love the you had at home. Such fun coming to your Teas! So sorry I'm so late, my daughter told me on Tuesday she was getting married on Friday I had to do a reception. I been so busy! Thank you for joining me for Tea Time Tuesday.